300 thread count in twill gives durability and a luxuriously soft feel. Thermal regulation keeps baby cool in summer & warm in winter. A great nights sleep for your baby means a great nights sleep for you! Eastwind 100% organic bamboo cot sheets are sure to keep bubby super comfortable and sleeping throughout the night. Choosing the right linen for your newborn is a difficult task. The most important thing is to ensure your child experiences comfort and warmth as well as minimal exposure to harmful chemicals. 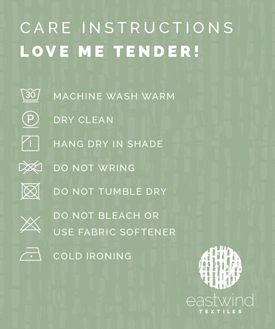 Eastwind bamboo baby cot sheets possess the Oeko-Tex Certificate 100, this means they are free from harmful chemicals. The certification of the Eastwind products assures you that each of the items are safe for your entire family and not just for your children. Set consists of one fitted sheet, one flat sheet and one pillowcase. The nature of the bamboo material is that it is not only breathable and durable, but also soft and absorbent. With a newborn, a moisture absorbent material is ideal to assist your baby in remaining comfortable and peaceful throughout the night. The anti-bacterial properties of the bamboo cot sheet set and even the bamboo baby blankets, helps to reduce any odours that may be left behind in a regular cotton option. The natural product these blankets and cot sheets are manufactured from are also ideal for your baby’s sensitive skin or allergies. Bamboo is a cost-effective option as well as a safe and soft choice for your newborn. These items are extremely durable and hold their shape and comfort after multiple uses and laundering. The longer your bamboo cot sheet set and blankets last, the better your pocket will feel.